While for many patients knee replacement surgery may seem like the only option to return to a mobile and pain-free life, total knee replacement surgery is still often referred to as an “elective surgery”. This sets it apart from life-saving surgery, and reflects the fact that the decision to undergo total knee replacement surgery is yours alone. It is important to be aware of the options when making the decision to pursue surgery. There are some alternatives to knee replacement that should be weighed prior to making your choice. These knee replacement alternatives can reduce a patient’s pain and increase mobility. You may decide that living with your arthritic knee is the best choice; not everyone elects to treat this condition with total knee replacement surgery. If you have limited mobility, you may choose to avoid strenuous and painful activity, and adopt a regimen of gentle exercise. Weight loss can have very beneficial effects on patients with arthritic knees. By reducing the stress on your knee through weight loss, you may be able to regain some mobility and lessen your pain. In some cases, massage therapy, the application of heat, or other physical therapy may be helpful. Additionally, you may be able to treat the symptoms of osteoarthritis of the knee through medication. Anti-inflammatory medications and painkillers may lessen the pain of osteoarthritis, and delay the need for a total knee replacement. Injections, such as cortisone or hyaluronic acid (HA) may increase your mobility and lessen your pain. Assisted mobility devices such as canes and crutches may be necessary in some cases. Arthroscopy, a minimally-invasive surgical procedure, can help treat the symptoms of osteoarthritis and mitigate the need for a total knee replacement. This procedure requires a small incision near the knee, allowing a surgeon to use specialized instruments to trim and smooth the worn-down cartilage caused by osteoarthritis. This can reduce inflamation, and since the procedure is minimally-invasive patients can return home the same day. Unfortunately, knee arthroscopy is not capable of treating sever cases of osteoarthritis, and is sometimes only a temporary fix in patients who are advancing through the stages of osteoarthritis. In some cases, the entire knee does not require replacement. For these patients, a partial knee replacement, or uni-compartmental replacement, may be recommended. This occurs when there is uneven wear on the knee joint, and there healthy cartilage remains intact. Recovery time and physical therapy for partial knee replacement surgery is comparable to that of total knee replacement. This procedure is fairly uncommon, as most patients experience even wear in their knees. 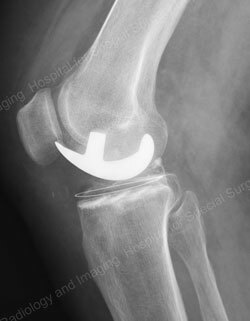 For patients in whom the risk of failure in knee replacement is deemed to be very high, knee fusion may recommended. This surgery does not allow for the flexion of the joint, so mobility will be impeded following surgery. In this operation, the femur and tibia are fused together with pins or screws, allowing for the bones to fuse together. Patients who undergo this treatment will live with a nearly-straight leg for the rest of their lives, but the condition is not considered painful. This treatment is only recommended when total knee replacement is deemed risky or impossible. Some patients may find relief from specialized knee arthritis braces. These devices are designed to redistribute the load on your knee to an area that is more capable of handling stress. These knee braces are often used in less-advanced cases of knee osteoarthritis, when there is still some cartilage remaining.